G Major, No. 5 in D Major and No. 6 in B-flat Major. Set of three 1798 (parts only) and modern performing edition, score and parts, including cello parts. 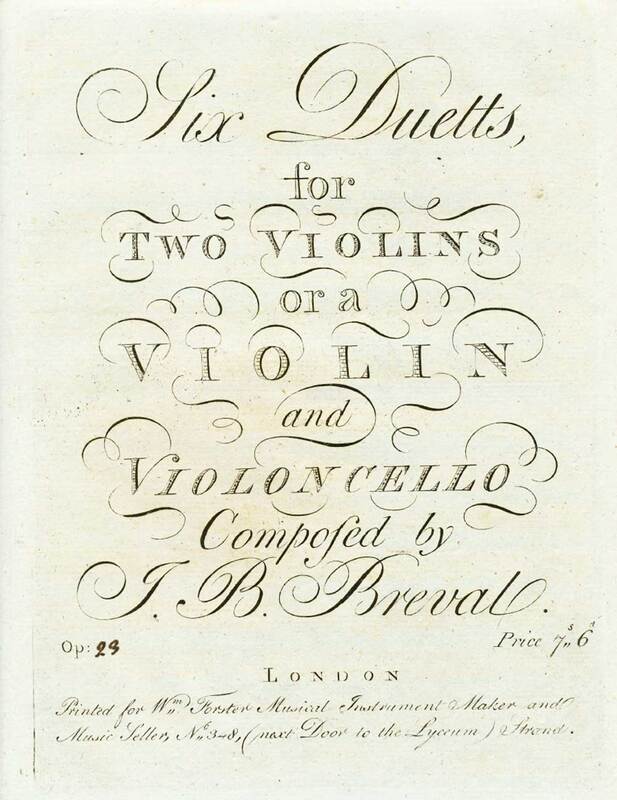 Jean-Baptiste Bréval (1753–1823) was a French composer and cellist. His Treatise on the Violoncello, Op. 42, was published in 1804. The Six Duetts, Op. 23, for 2 violins or violin and cello were written ca. 1798. Duett No. 4 in G Major has a sonata form first movement, an Andante second movement titled Romanza and a Rondo third movement marked Presto ma non Troppo. Duett No. 6 in B-flat Major has only two movements: a sonata form first movement and a Minuetto with 4 variations.